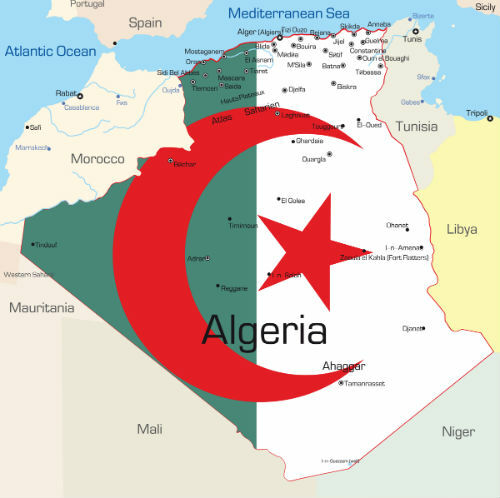 Algeria is a country located in North Africa. It borders Morocco, Tunisia, and Libya. The northern most part of Algeria is on the Mediterranean Sea. Algeria has a very long history with many different ethnic groups. Many of these groups have lived in Algeria for thousands of years. In fact, Algeria has one of the longest known histories in the world. There is evidence (signs that show something) of people living in Algeria up to 10,000 years ago. Much of this evidence can be found at a place called Tassili n'Ajjer. Tassili n'Ajjer is a place located in the southeastern part of Algeria. Is it is a very large place that is 72,000 square kilometers in area. It is in the desert so is very dry. It also has many large rocks and mountains. It is a UNESCO World Heritage Site. UNESCO stands for United Nations Educational Scientific and Cultural Organization. This means that this place protected by the United Nations. In 1933, archeologists (scientists who study history) who were exploring (looking at) Tassili n'Ajjer found something very special. They found cave paintings and drawings. A "cave" is a hole in a mountain or large rock. People who had lived at Tassili n'Ajjer many years ago painted these paintings. They tell the stories of the history of the area and the people who lived there. The paintings and drawings show pictures of three different topics: the change in the weather or climate of the area, the movement of the animals, and the evolution (change) of humans who lived there. Today, archeologists can look at the paintings and understand what Tassili n'Ajjer looked like 8000 years ago. They can also understand what animals lived there and what the people who lived there ate and looked like. So far, archeologists have identified 15,000 paintings and drawings. They have discovered (found out) that these pictures were drawn during five different time periods. They can tell when a picture was drawn by what is shown in the picture. 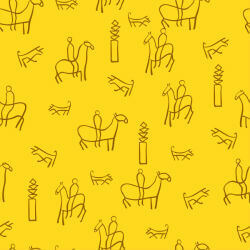 For example, many of the pictures were drawn or painted from 4000 – 1500 BCE. These pictures show lots of cows and pictures of the humans' everyday lives. Other pictures show camels and lots of desert. These paintings were done later, around 0 - 1000 CE. What these pictures tell us is that when cows lived in the area, from 4000-1500 BCE, there must have been a lot of water there. Cows need water to drink and grass to eat. However, camels do not need grass or very much water. They like to live in the desert. 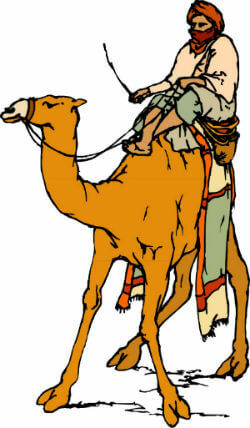 This means that when the pictures of camels were painted, between 0 - 1000 CE there was no more water or grass. Tassili n'Ajjer had become a desert sometime during those 5000 years. Because these paintings are so important to history, they are being very well protected. The Algerian government as well as the United Nations takes care of them. Scientists are also doing research to learn how they can protect the paintings from the weather and the heat. It is important to preserve (save) the beautiful images so that we can all learn about our history from them. 1. What does "evidence" mean? 2. What does "archeologist" mean? 3. What does "evolution" mean? 1. Tassili n'Ajjer is _________ UNESCO World Heritage Site. This means that it is protected by _________ United Nations. 2. People who _________ at Tassili n'Ajjer many years ago painted these paintings. 1. How long have people lived in Algeria? 2. What was found at Tassili n'Ajjer? 3. Why is it important to protect Tassili n'Ajjer?